Abbey D'Agostino hugs Nikki Hamblin after Round 1 of the women's 5000-meter in Rio de Janeiro, Brazil. 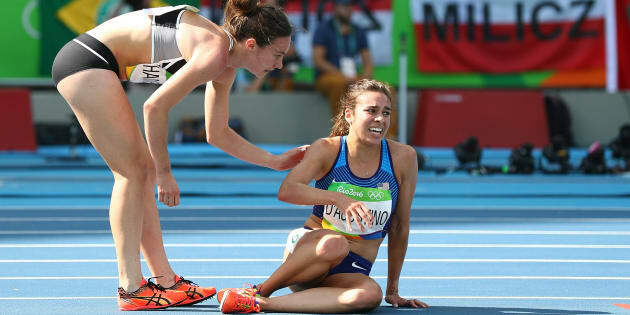 When Abbey D’Agostino of Team USA and New Zealand’s Nikki Hamblin tumbled to the ground during Round 1 of the women’s 5,000-meter race on Tuesday, they quickly decided there was only one thing they could do. In a moment of true Olympic spirit, they did exactly that. D’Agostino, who had an injured knee, fell behind Hamblin as they ran toward the finish line together. But when Hamblin turned back to the hurting American, D’Agostino told her to keep going. D’Agostino eventually finished the race, albeit in last place with a time of 17:10. Hamblin came in second to last, at 16:43. The two runners embraced at the finish line. Hamblin later helped D’Agostino into a wheelchair. There is some good news, though: Both runners qualified for the 5,000-meter final because they were tripped.